Estonia has one of the most developed mobile markets in Europe. The cellular penetration rate in the country is 141% (about 1.84 million connections). 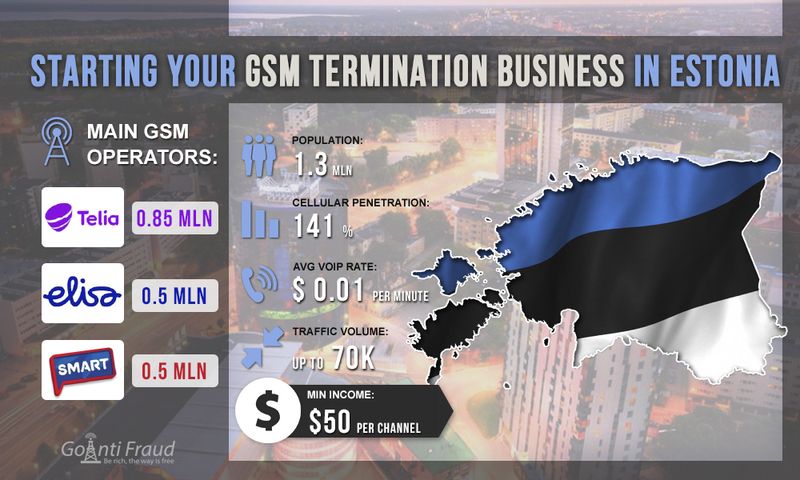 Although the population in Estonia is small (1.3 million people), local mobile operators transfer quite impressive volumes of voice traffic, which makes it possible to make money on GSM termination even with a small average rate. Each of the local GSM-operators has a fairly good coverage in the country, so you will find a stable signal throughout the whole territory. Prepaid SIM cards are called Kõnekaart in Estonia, they are sold both in Telia, Elisa, Tele2 retail stores, and in many kiosks, supermarkets, grocery stores and other outlets. To purchase cards here you will not need to present any documents, and you do not need to register a subscriber number either. The cost of one SIM-card starts from 1 euro (this is about $ 1.14). As well as in other Baltic countries, operators in Estonia offer minimum rates for cellular communications, in comparison with other European countries. With fairly low average voip rates europe, this is very beneficial in terms of traffic termination. The greater the difference in the cost of a minute of international and local calls - the higher is the profit of the entrepreneur. With the equipment running for about 5 hours a day, you will be able to receive revenue of $50 and more from one channel of GSM gateway.